If asked to name my favorite chefs, Joël Robuchon comes in at or near the top of the list. 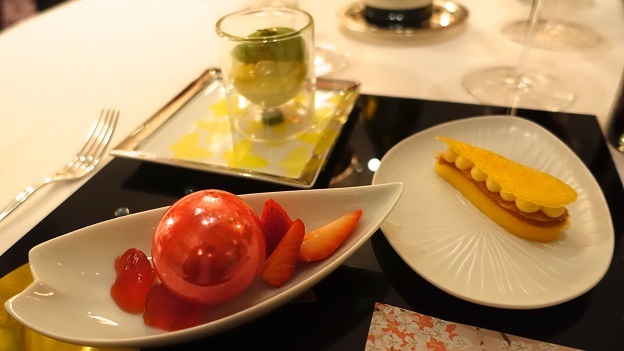 When Robuchon had his Atelier in New York City it was our destination of choice for a special night out. I rarely indulge in elaborate dinners when I am on tasting trips, but my last night in Bordeaux turned out to be a perfect opportunity to check out Robuchon’s recently opened restaurant in Bernard Magrez’s La Grande Maison hotel, which is in the center of town, right across the street from Magrez’s Cultural Institute. Robuchon has only been open for a few months in this location, and while some rough edges appeared over the course of the evening, I would go back in a heartbeat. The food and setting are a treat for all the senses, from the visual to the sensory to the purely hedonistic. Walking into the room, I can’t help be struck by the sheer beauty of the setting, with it deep shades of lusty red and purple juxtaposed with a much formal library in the adjoining room, all in the glow of the late afternoon spring light. The dining room is formal yet also airy and whimsical. In other words, the perfect setting for what is to follow; a brilliant combination of superb food presented with striking visuals and just a touch of theater. Even with all of the flair, though, the focus on the cooking never falters. 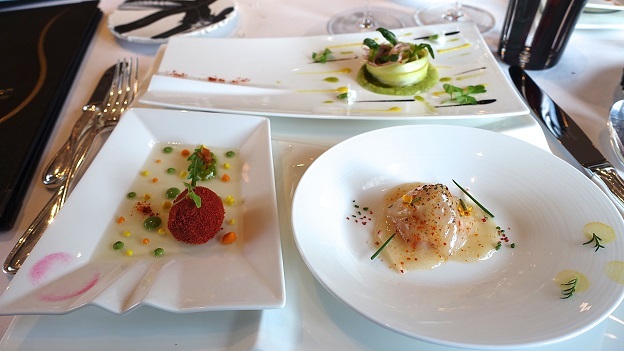 The menu is offered as a multi-course sequence of dishes organized in flights. At least that is the way it was presented to us. Later, I see other tables ordering à la carte, but for some reason that is not an option we are given. I am not sure why this would be the case, but it is the first slight hiccup of the night. 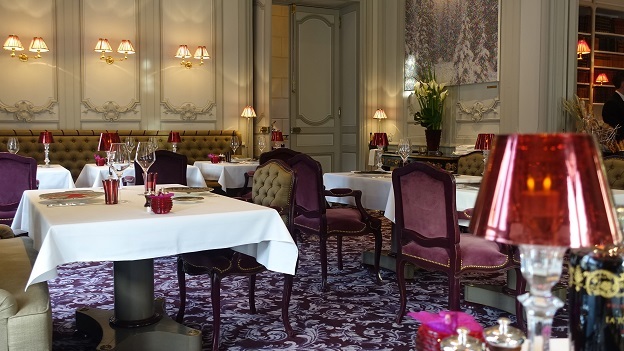 For such a formal restaurant, the service is polite but also much more low-key and – dare I say – friendly than is the norm in France. The captains and waiters seem to take real pride and a sense of childlike joy in their roles, which is so refreshing. The wine program is intriguing, especially for a restaurant that has only been open for a few months. Naturally, the emphasis is on Bordeaux. Quite unusually for a restaurant with this level of ambition, the list contains a good number of reasonably priced wines, starting at the entry-level, where there are more than enough choices in the €50-70 ($55-80) price range to have a very enjoyable evening. It is so refreshing to see a conscious decision to deliver value and not just super-rare, expensive wines with huge markups. If money is no object, there are plenty of trophy wines on the list, but even those wines are reasonably priced in this context. And of course, many of Mr. Magrez’s own wines are available, with a good selection of older vintages. Wine service is another thing altogether, and is an area where there is considerable room for improvement. At a top-level restaurant, I expect a sommelier to be proactive, especially when it comes to pairing and/or suggesting wines with a tasting menu. The food is so dazzling for all the senses. Why not do the same with wine? By the time we decide what bottle to order mid-dinner, the wine staff has fallen behind at a number of tables because they do not make an effort to anticipate guests’ needs, and that is when the wheels start to come off. Our Burgundy, from one of the top names in the Côte de Nuits, is served in musty glasses that smell like paper towels, which adversely affects the wine to a significant degree. That just can’t happen at this level. But getting back to the food, well, our dinner is full of highlights, starting with a bread selection that is as breathtakingly beautiful to look at as it is delicious. 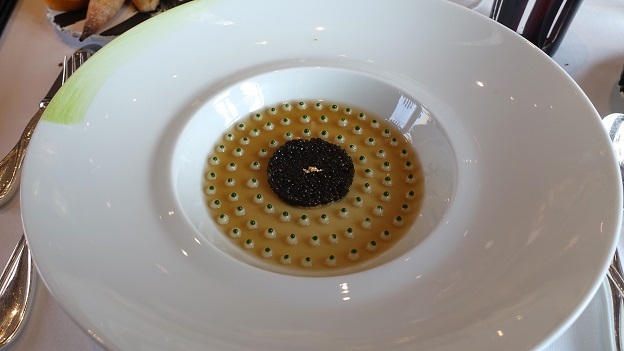 The caviar starter is to die for. Frankly, a more attentive sommelier would have brought over or offered a glass of Champagne. A fresh Blanc de Blancs would have been perfect. The green asparagus, with its bold, vibrant flavors is superb, as is the tomato with citrus-infused olive oil. Robuchon is the master at presenting intensity without weight, a theme that runs through all of these early courses. Playful and delicious, the frog leg fritters are a delight. I also adore the langoustine ravioli, which I see several nearby tables enjoying full portions of. Those guests know what they are doing. The dish is bold, lusty and immensely flavorful. The crayfish in light morel broth and bass with Malabar black pepper ravigote, a sort of rich vinaigrette, are both tasty. A perfectly cooked Châteaubriand with foie gras is the main event. The presentation alone is striking. All the elements on the plate are pure perfection, from the temperature and seasoning of the meat, to the sauces, to the delicious whipped potatoes. Classic and yet modern, the kitchen nails this dish. My only question is, what happened to the rest of the Châteaubriand? The entire piece of meat is shown at the table but only one slice ends up on the plate. I hope the staff ate the rest. There is a delicate balance between luxury and unnecessary waste; the latter, in my view, is a value that is completely out of sync with modern-day society. I would like to spend more time with the cheese selection, as the choices are vast. Here, too, presentation and service are top-notch. The pre-desserts are visually arresting and delicious. What else is new? The sugar bubble with strawberries and Tahitian vanilla is a magnificent interplay of flavors and textures. Dinner ends with a very traditional dessert cart that will leave sweet lovers weak at the knees. This is my last night in Bordeaux after two weeks of intense tastings, so I am perhaps a bit less interested in wine than would normally be the case. The 2005 La Tour Carnet is a delicious, affordable wine off the list with lovely early tertiary notes and more than enough fruit to drink well for at least another handful of years. This is a brilliant showing. 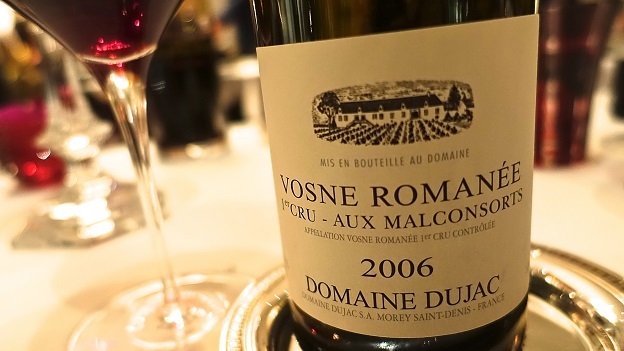 Dujac’s 2006 Vosne-Romanée Aux Malconsorts is a bit of a mystery. I loved this wine from barrel and purchased quite a bit of it, but this is my first tasting from bottle. I am not sure just how much the musty conditions of the glasses affected the wine, or if this was not a perfect bottle, but the fruit appeared muted and the acidity very high. Of course, 2006 was a tricky vintage in Burgundy, but my memories of the Malconsorts are better than what comes through in this bottle. As we were leaving, I spotted several of Bordeaux’s heavy hitters in the room, and with good reason. Our dinner was absolutely sensational. 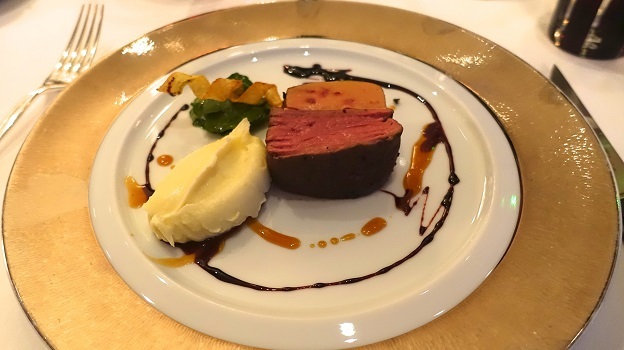 Although there are some areas for improvement – notably with wine service – for a restaurant that is just a few months old, the Joël Robuchon Restaurant in Bernard Magrez’s La Grande Maison is well worth a visit.